According to Statistics Finland, turnover in service grew by 6.2 per cent in November to January from the corresponding period of the year before. All service industries grew. Development was strongest in administrative and support service activities (+9.5%) and accommodation and food service activities (+9.0%). Turnover in transportation and storage attained good growth of 7.3 per cent from one year back. Information and communication activities grew moderately by 3.1 per cent. Services are here examined exclusive of trade. 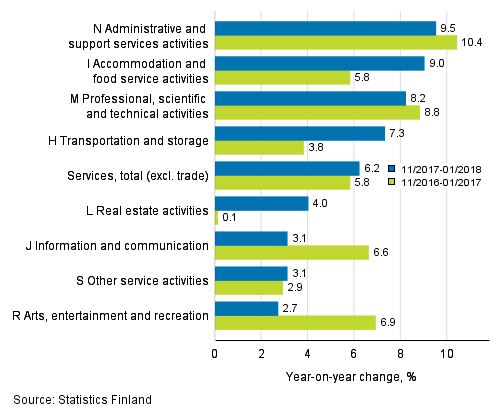 Administrative and support service activities were boosted most by renting and leasing activities (+16.9%). Employment activities (+15.1%) also boosted the industry’s turnover. Travel agency and tour operator activities, as well as other reservation services grew by 9.2 per cent from the corresponding period one year ago. Accommodation and food service activities was supported by good development in both accommodation services (+11.8%) and food service activities (+8.3%). Of the sub-industries of transportation and storage, warehousing and support activities for transportation (+9.3%) and land transport (+5.8%) generated growth for the industry. Water transport (+0.3%), in turn, remained on level with the corresponding period in the previous year. Development in information and communication activities was slowed down by the subdued growth of telecommunications (+1.8%) and computer programming, consultancy and related activities (+1.5%). From this release onwards the turnover of service industries will adopt base year 2015=100. ISSN=1799-0998. January 2018. Helsinki: Statistics Finland [referred: 25.4.2019].